My alarm went off at 3:30 am, and I immediately sprang to my feet (I’m a morning person, clearly). By 4:20 I was on the road to Steve Snow’s place, and by 5am I had his company with me while I drove Ruby the Exxy. 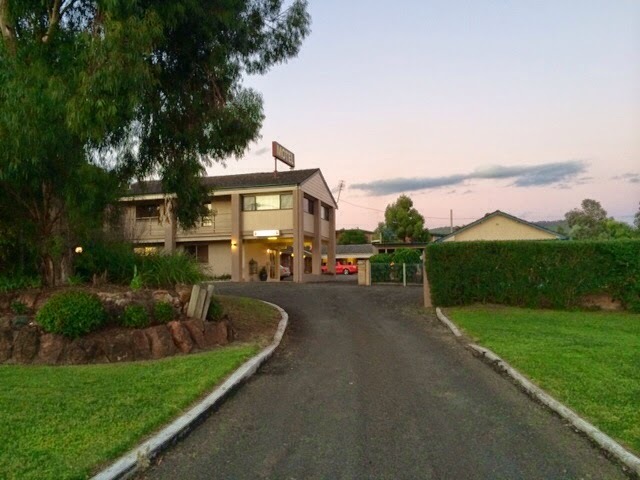 It was a cold easter Saturday morning, and we would see another car on the road roughly every 20 minutes until we finally rolled onto the New England highway. The New England is another of 3 alternative routes between Brisbane and Melbourne. And one of two that passes through Sydney. It is also called New England for a very good reason. The route passes a long series of pastures and towns that have retained their very british pastoralist roots. Many european trees dot the route, and the landscape often feels like the rolling hills off what many of the earlier Australians called ‘Home’. Past the town of Ipswich we began to drive through some quite thick sections of fog. With a quick flick of a switch, Ruby’s fog lights powered on, and we then happily continued to drive along the highway as the sun started to rise over our left shoulders. 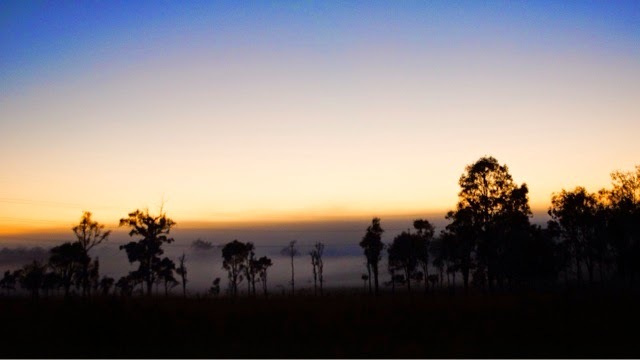 The fog shifted aside, and we soon found ourselves driving up the Great Dividing Range as the sun hit the mountains with a beautiful Orange glow. The view was incredible as we looked along the tinted mountain range, but sadly couldn’t find a spot to stop and take a photograph. We grabbed some breakfast in Steve’s home town of Warwick, and we were quickly back on our away again. 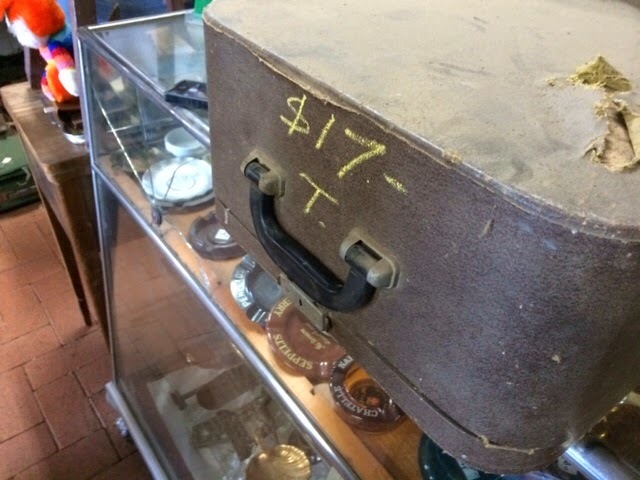 We rolled into a couple of towns and found that we were either too early for their second hand and antique stores to be open, or in some cases too late – as Google seemed to insist that some stores that had been closed for years were still open. Sadly, many of the towns along the New England feel like ghostly shells of their former glory. Hints of how life was in days that have passed, and relics of the means and methods of trade and business that once drove the economy in these rural areas still survive but are sadly crumbling as people drive past them. There’s both a vibrance and sadness about the fading history along these highways that many travelers miss in our contemporary era. In my car I already had 7 typewriters. These were machines that I either couldn’t pack into boxes due to the oversized nature of their cases, or the fact that they were standards that were also way oversized and had carriages that couldn’t be removed. 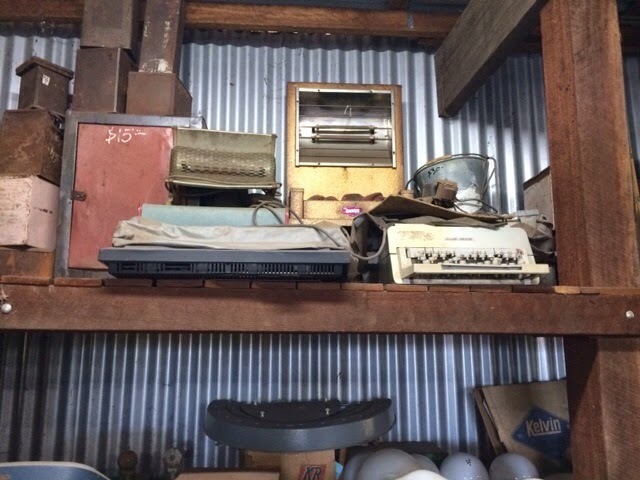 These were machines that I wouldn’t trust with removalists, so I decided that while I’m taking the car down to Melbourne, these may as well come with me along with the car-load of stuff that I had packed for Miss Jane. 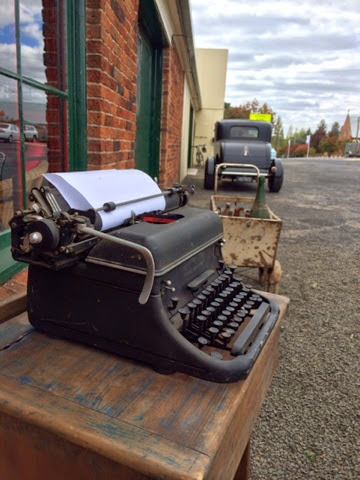 It wasn’t until we hit Armidale that we saw our first machine. It was a lowly Adler ‘Tippa’ – for want of a better name. 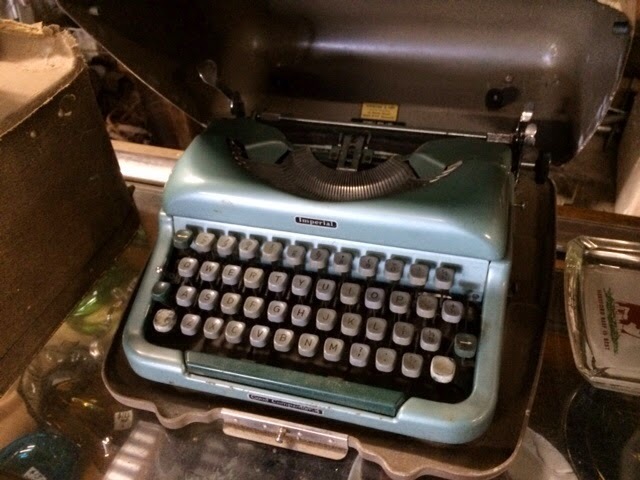 This machine in comparison to my earlier model Tippa typewriters was awful to type on. It was in great condition however, and I was somewhat surprised to find that it’s shell was metal. It was even at a great price of $15. However both Steve and I decided to throw this fish back in, and let it go to another owner. It wasn’t even worth my effort to buy and re-sell on ebay, as it wouldn’t get more than $30 or so dollars. We hopped back into Ruby and quickly headed out of town. 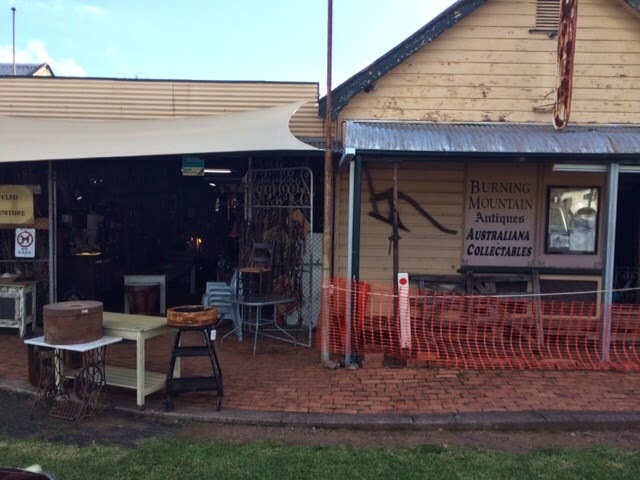 It wasn’t long until we came across a smaller town that had a disproportionate amount of second-hand or antique shops. The very first shop we came across bore hunting success before we even got out of the car. As Steve pulled Ruby into a parking spot in front of the shop, we came face to face with a familiar sight – a Remington 17 perched immediately in front of our car. I asked the woman in the store how much she wanted for it, and she gave me a surprised look before shrugging her shoulders and saying ‘aww…… fifty bucks’. The tone was rhetorical, which told me she was clearly open to negotiation. I thought I could press the point and get the machine for $30, but I simply felt that I had too many machines in the car as it was, and the condition of the machine wasn’t that amazing that I felt compelled to buy it and rearrange the car to fit it in. So we left this beast to the next buyer, and shuffled into the workshop next door to check out what else was happening. 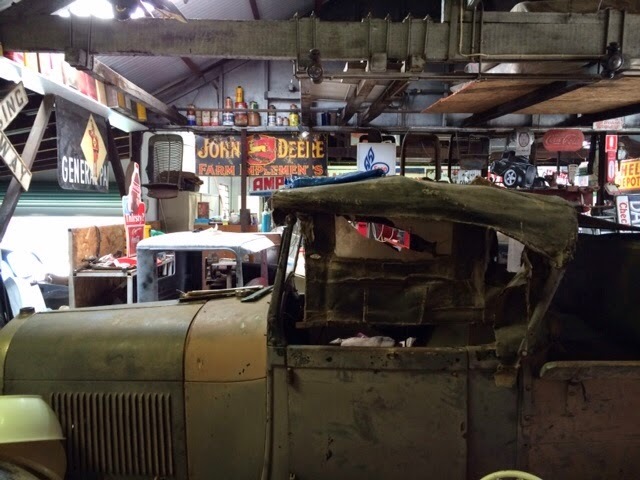 Here we found an array of car parts and old tools for sale, as well as a fully-functioning hot-rod restoration workshop. Futher down the road we found two more shops. However, these places sadly yeilded no fruit. The city of Tamworth was a bust, but we did get an excellent lunch there. Steve however discovered that a fully-loaded X-Trail is oddly hard to parallel park, and as such parked my car about a meter from the curb. The Exxy is by no means a ‘big car’, and as such it still didn’t exactly stick out over the road. Tamworth is the self-appointed capital of country music in Australia, and you can see this in almost every nook and cranny of the place. Country music is worshipped so much in this place that they’ve constructed a giant golden guitar on the road into the town that confronts everyone coming up from Sydney. It is so bad that whenever I book a hotel there, I can’t book it by my last name as it invariably leads to lengthy questioning about my somewhat famous country music relatives. Usually Tamworth had been an end-point on a drive for me, and this was only the second time I had driven through it either two or from Brisbane. I’ll just stress that I’m in no way a fan of country music. So dear readers, don’t start getting an image of me walking around in cowboy boots and an Akubra hat, while listening to some melancholic twang. So we drove on and enjoyed a lovely piece of the Australian countryside. It had rained a fair bit recently, and everything looked kind of fresh and clean. A bit north of the town of Scone we turned off the highway at a second-hand shop that I’d visited in the past. It had previously gotten some great deals on some stuff here, and it is a must-stop part of the journey. 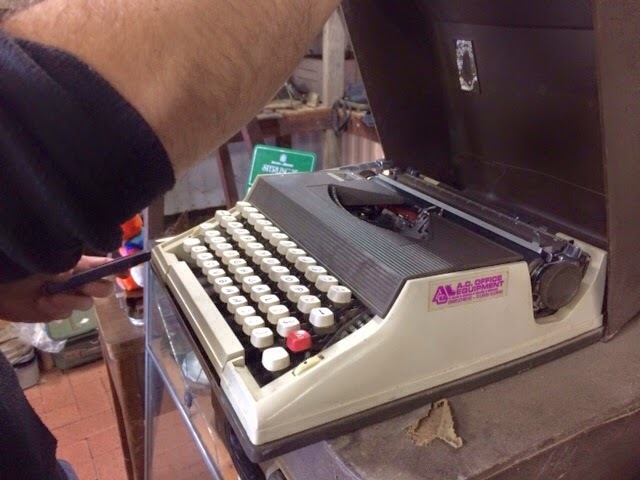 Steve and I got down to the business of looking for typewriters, and Steve within minutes spotted an Olivetti Linea that was in awful condition. Flanking this machine was a dusty electrical of some kind. They were on a high shelf and out of reach, and by the time I got down to that end of the shop Steve was busy trying to find something that would get him up there to have a look at these machines. I looked further along the same shelf near these machines, and noticed some familiar looking boxes and vinyl covers. I pointed them out to Steve and said ‘Those are going to be of much more interest to us’. Steve agreed and then excitedly ran off to find the shop-keeper to get a ladder. I spotted a small black case that I thought would be specifically of interest, and there was a brown case that I immediately thought to myself ‘That looks familiar, I wonder what it is’. But despite my enthusiasm for the first case, it turned out to be a rather dull looking Lamir that came with a $27 price tag. I photographed it for the record, and looked at Steve who also declined it. With a $17 price tag however, the brown box turned out to be a very familiar Remington Quiet-riter. Another familiar case grabbed my attention, and I needed no prompting to know what machine was inside. It was unmistakably an Imperial Good Companion 4. It has a price tag of $37, and was extremely dusty. Inside the machine looked dull, chipped and stained. But I ran a thumb lightly across the surface, and what I thought were chips in the paint turned out to be just debris that had blown into the case. As I rubbed a near perfect IGC started to shine out at me from beneath the deceiving detritus. This machine was actually in incredible condition. Steve declined on both the IGC and the Quiet-riter, and left it to me. I made an offer of $30 for the IGC, and the seller accepted. I then made an offer of $15 for the Quiet-riter. He thought a little, then also accepted that. With a promise of a dusting, they were mine. On a side note. In the last 2 weeks I’d just sold an IGC4 and Quiet-riter. There’s a real irony to the machines that I moved to get rid off from collection seem to in some way or another find their way back. Both of these machines are in better condition than the ones I sold, even though the Quiet-riter’s case probably needs a re-covering. There were some other interesting machines to be found there too. They had a Smith-Corona electric machine of a more modern era, which we didn’t even bother bringing down from the shelf. 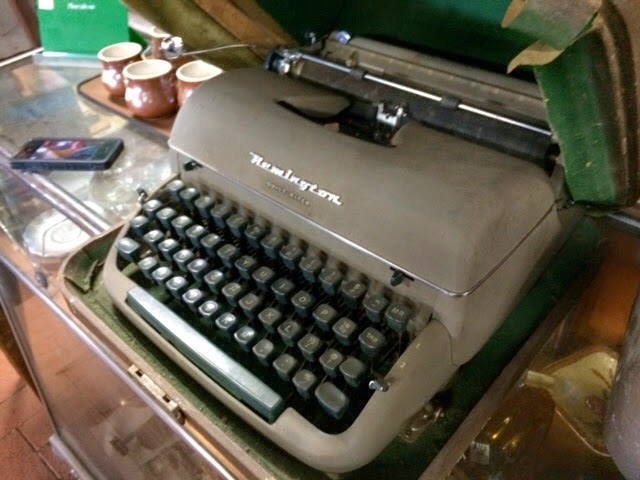 A remington SJ with and interesting Bakelite facia that I’ve only come across a few times in the past – complete with Remington Super-riter Vinyl cover. But I think I got the most interesting machines that were available from that batch. When I went to pay for the two machines, the guy at the counter had not only dusted the cases off, but had wrapped them in garbage bags so that no further muck spread about my car. I found that incredibly thoughtful and considerate. 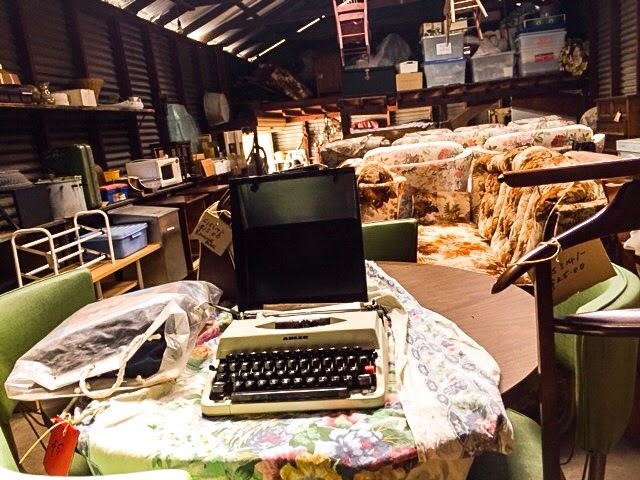 I gleefully handed over my dosh, and took my typewriters and found a spot for them in the back of Ruby. 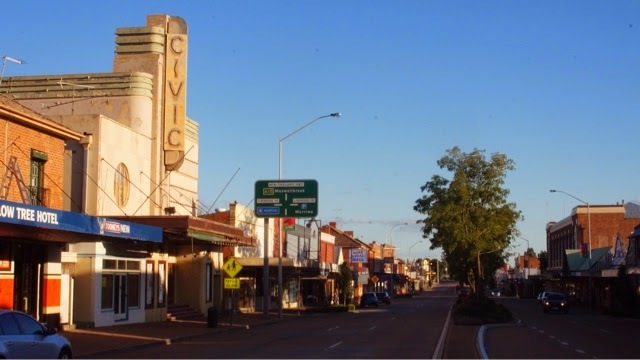 No sooner had I closed the back of the car and reversed out onto the highway Steve and I found ourselves rolling into our destination for the evening – the town of Scone. The lady on the front counter at the Isis hotel greeted me with one of the warmest smiles I’ve ever been given at a hotel, and she soon had us organized with a room. I quite liked the Isis hotel, and I’d recommend it to anyone. As I got settled into the room I started to smell a wood fire getting started. The hotel cooks pizza in this wood fire, but Steve and I headed into town on foot where we grabbed a pizza there, which we ate in somewhat deserted, but historic pub that was being run by a very lovely and enthusiastic woman by the name of Sarah. We had a few beers and talked travel with our host before we bid her farewell and left her with her boyfriend to close up the old pub. With full bellies and a satisfied feeling we walked back to the room and hit the hay ready for our next day’s driving through Sydney to Canberra. ← We’re going for safari…..
Nice IGC! No tea shops selling scones? Sadly, no. But plenty of beer! Great photos. 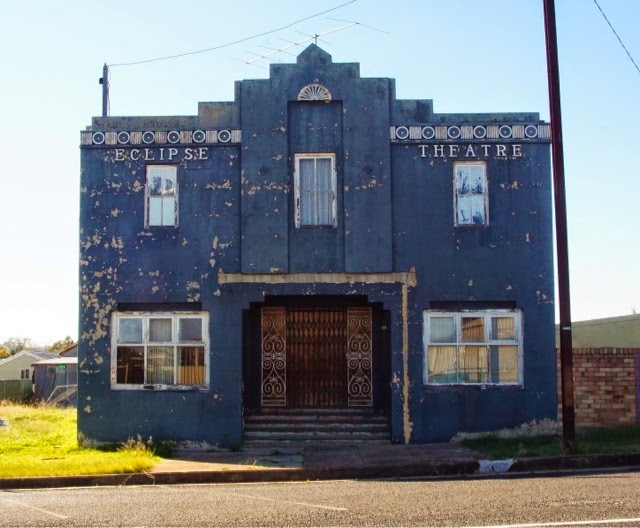 Those old theatres — the Eclipse and Civic — are haunting. Wow, Killer photos! That's the difference a decent camera makes. A fun drive it was. 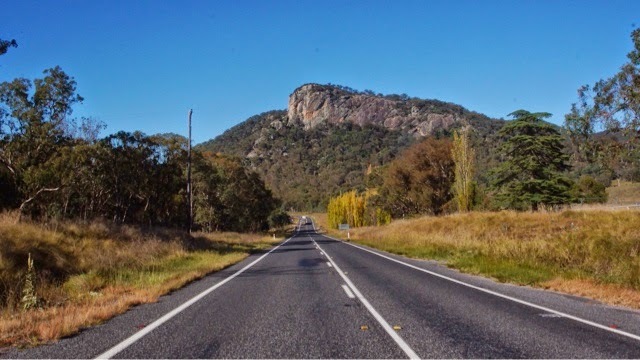 Stunning road mountain picture! But I guess you see that plenty of times. The desk that Rem17 is standing on also looks interesting. 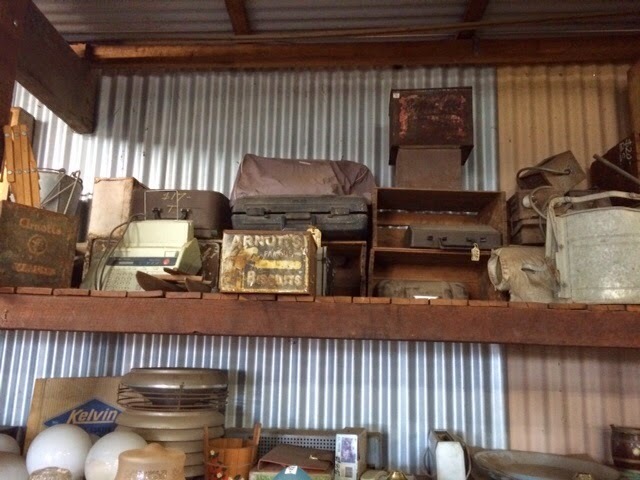 And the shop that you bought the typewriters from looks like a great hunting place for… everything old and dusty. Real nice! It already looks like a wonderful trip! I've always loved the civic, but it depresses me when I see it as the guy that owns it refuses to sell it and let others rejuvenate it. He's more interested in letting it degrade until it falls apart and can't be national trust protected. Yeah! Let's do it again sometime. I like to think it was the photographer, and not the camera… buuuut it did help to have a better camera with me. Thanks! But actually this was the first time I had been through that stretch, and I'd never seen that mountain before. I usually take a different route. And you're right… if I had more room in the car I would have come away with many, many more items. great stuff. Scone is Packer country too, if I remember right. Let me know how the Quiet-Riter runs. Great machines. As you know!